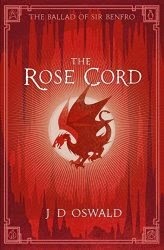 I reached the end of The Rose Cord earlier than I anticipated due to an extract of the next book being included. I was glad. This is the kind of book which makes me want to shake the author; there is a decent novel in here with some brilliant details and fabulous ideas, but it's been buried in one of the most tedious and repetitive things I've read in ages. You know the second series of Game of Thrones where Rob Stark spent 86 hours looking grumpy in a variety of fields? The Rose Cord is basically that, but without Mike from Casualty. To begin with, The Rose Cord is pretty good despite some minor issues, but unfortunately these are the same issues which will come back to haunt it later: repetition. Rather than having a single scene which achieves all it needs to, Oswald has a habit of having his characters plod through a similar situation multiple times advancing their understanding only a small amount with each. For instance: Beulah, the young Queen occupying Errol's throne, discovers a plot to kill her, so she deals with it in her own inimitable way: kills her would-be assassin and shouts at everybody for a bit. Naturally, he was not acting alone, so there's another would-be assassin to deal with. And then there's another. Although each scene is different, and each moves the story forward in it's own vital way, it's a good example (within the first 13%) of how the scenes should be working harder and doing more. Benfro suffers from this problem the most. In Dreamwalker he was entertaining and tremendously likeable, but with the removal of the villagers he's mostly a dragon wandering through a wood. He occupies the bulk of the book but vast swathes of it involve him being on his own not doing a great deal and it's all the more frustrating because there is gold them thar chapters, it's just not worth the trog to get to. Plus, doing so requires reading about Malkin the squirrel, a character I would happily watch taken out at dawn. The pacing, too, is wrong. From 70% I was reading believing it would get better - the third in the series is already out in ebook with the paperback happening soon; there is going to be a forth. From 88% I was reading with the glazed determination of somebody who's read that much and is jolly well going to finish just so she can write a fair review of the damn thing. The great dramatic end-scene is crippled by the billion pages of Benfro-is-in-a-cave which precedes it. Throughout, so much space was given to things not happening that when something did, it was ... lost. Errol has more to do in this book and his is a far stronger story than in the first, but for much of the book - as in Dreamwalker - he is at the mercy of things which happen *to* him, and he's too bland for me to care much. His story is more engaging, but not enough to carry the book. I liked Dreamwalker a lot - I gave it four stars - but The Rose Cord is weeping for structural edit so hard I do wonder if this is the original self-pubbed text and a new version will get introduced close to its November paperback release date. There are some really great ideas in The Rose Cord, but the last 15% (of this 476 page book) is shear tedium; I won't be continuing with the series: 2 stars.